for a more proper centerpiece. I didn't move it far . . .
Just to the server in front of the windows, where, I think it looks smashing! Much better than as a centerpiece! 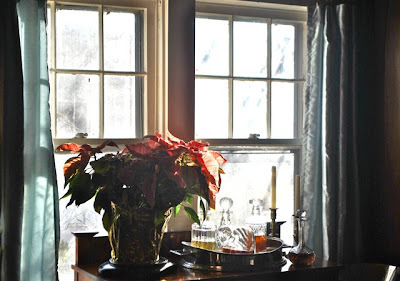 The light was coming in the windows this afternoon and I loved how it lit the poinsettia. keep a plant here -- it would be good for the plant and makes for a better tabletop, I think! We do exchange gifts -- The Lunch Bunch and I. And my gifts . . .
A tin of Gunpowder Green Tea. Which actualy is my favorite green tea. A jar of Sally's aunt's homemade mustard. It is sooo good that recipients often hide it from their husbands -- and I could eat it from the jar with a spoon! A Santa ornament . . . Which have a story . . . . The silver bowl full of pinecones and greenery . . .
And the two little lead "snow birds"! The Story Of The Birds . . .
And after lunch, we did the shops of Crestwood. A favorite of mine is The Pear Tree . 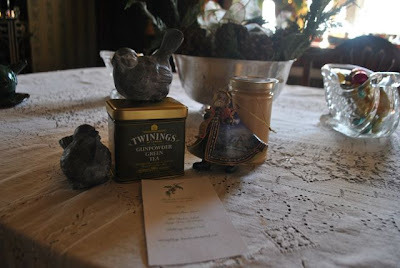 . .
And at the shop were these cute little lead birds. And so I had to leave them. But I've thought about them . . .occasionally. And to find them Thursday in the gift bag. How thoughtful of these lovely ladies and dear friends! 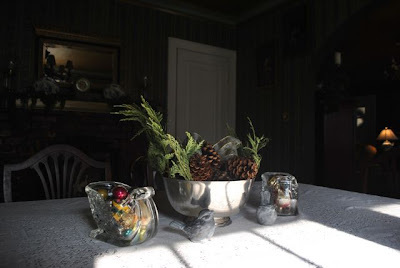 They won't live permanently on the dining room table. I'll find a better home than that. Isn't it funny how we think we have things set in our rooms the way we want them, then when we make an unforseen change it becomes our favorite? What a very sweet post...It's always new and refreshing to change things a bit! Though I don't comment on your blog very often, I do enjoy reading it. Wishing you and your family a very Merry Christmas! Merry Christmas! The poinsettia DOES look quite fine there...and aren't you blessed with thoughtful friends?!? Your lunch bunch gathering sounds like a good time and it was thoughtful for you to receive the lead birds. Aha! so we are both sagittarians! Happy belated birthday and a Merry Christmas to you, Jim and dear Dolly. What a sweet afternoon it must have been and what a pleasure to receive a gift that meant your friend was paying attention and wanted you to have something from her that would really touch your heart. Ah~h~h the simple joys of Christmas!!! I adore the story of your lead birds and know how much you are appreciated by your Lunch Bunch!!! Your poinsetta looks stunning in front of the window!! !